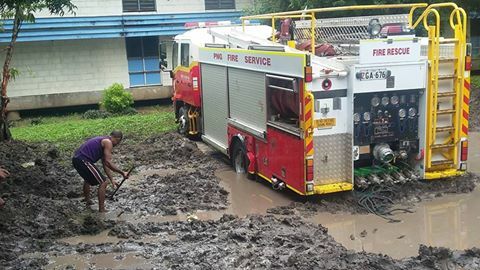 Pressure, frustration and haplessness are being experienced by members of the North Waigani Fire Service team as the one and only Fire truck belonging to the station is bogged down at the Talaigu Dormitory at the University of Papua New Guinea. During the operation on Friday night in attending to the freshman dormitory Talaigu, the Fire Hydrant broke off and flooded the area which bogged down the area where the fire truck was stationed and has turned the area into a muddy boggy pitch. “We are unable to move the vehicle now because everything is stuck down into the mud and we are receiving little help, we were promised that we will be assisted after I made the call to the director of public relations James Robins to get the vehicle out yesterday (Saturday) however since that time we are still struggling, up until just a while ago we had the Vice Chancellor Albert Mellam come in and stop the backhoe operator from getting the fire truck out”. Said Arifeae Farapo Fire Superintendent of North Waigani Fire Station. Superintendent Farapo is now appealing to stake holders partners for assistance to be provided in the removal of fire truck from the area so that all fire officers who are currently manually digging and pulling can return to normal duties of providing cover for fires. The North Waigani fire truck covers the whole of Morata, Hohola, Tokarara, and the Waigani Office areas and in terms of fires these areas are now vulnerable should a situation arise adding to this the vehicle was scheduled to provide cover for the International Delegation for the International Convention Centre from the 04th to the 07th of April.